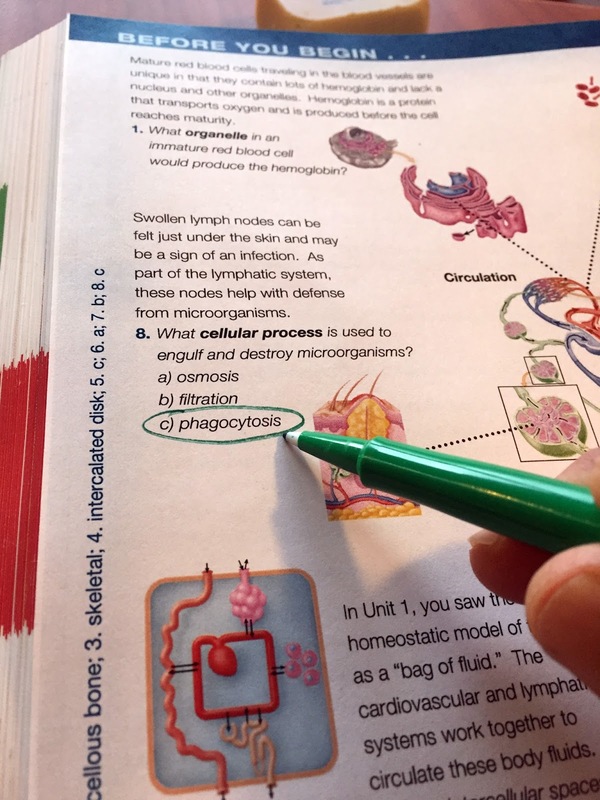 A particularly exciting update in the new edition of Anatomy & Physiology is the new learning feature in the opening of each unit of the book. Recall that A&P is chunked into more, smaller chapters than other 2-semester A&P textbooks to reduce a reader's cognitive load while learning. This improves both the reader's engagement with the book, making them more likely to actually read it, and the overall ability to learn from it. These small chapters are grouped into six logical units, mapped out in the color-coded list on the first page of the book (facing the cover) that corresponds to the color tabs visible on the page edges. In previous editions, the unit-opener page had a listing of the chapters within that unit plus a brief introduction to the "story" of the unit. I have now expanded that into a two-page spread that also includes a brief pre-test to get students engaged in the upcoming topics. Learning science shows that pre-tests help jump-start student learning. Long used solely to measure students' prior knowledge, pre-tests have demonstrated their own ability to enhance learning outcomes—even if teachers never look at the scores. I have found this to be profoundly true in my own A&P teaching. The concept and design of our new unit openers was worked out by textbook learning guru Michael Greer, veteran A&P teacher Terry Thompson, and myself. Terry then worked in consultation with me and our editors and book designers to execute the final versions. Students will see just a few illustrated questions that help students refresh learning from prior chapters that they'll need when reading the new unit, along with questions that preview new concepts they'll encounter. Such pre-testing "primes the pump" by getting them thinking about key concepts ahead of their reading. And it sets the stage for connecting new learning with prior learning. Readers get immediate feedback on the accuracy of their answers by using the answer key printed sideways along the page edge. Just like in a magazine quiz, eh? That ensures that they're not accidentally remembering the wrong answer as they read. Readers also get an embedded hint that tells them why the pre-test is there (to jump-start their learning). Of course, our students may just skip the unit openers. So we need to tell them about it. Continued and emphatic reminders of the value of these pre-tests in making their reading and learning easier is a key to its role in student success in our course. Nowadays, the keeping cash system is improved so well and security is so extraordinary. I think this information is charming and visit page everybody can appreciate the dealing with a record area and it is conventional information. In this area of the anatomy and the Physiology you can find the new circle of the life. Just go to page and find the new useful way to get the better pattern. You can learn more about the anatomy and the other deal of this section. The idea and plan of our new unit openers was worked out by course book learning master Michael Greer, veteran A&P instructor Terry Thompson, and myself. Terry at that point worked in discussion with me and our editors and book architects to execute the last forms. I actually try to visit the website because i contained a lot of valuable content here. The concept as well as strategy in our brand new device openers had been exercised through program guide understanding grasp Erina Greer, experienced A&P teacher Terry Thompson, as well as personally. Terry at that time proved helpful within dialogue beside me as well as the publishers as well as guide designers in order to perform the final types. see more details We really attempt to go to the web site simply because we included lots of useful content material right here.